Spring is here! Check out the Altoona Enabling Garden!! The Polk County Master Gardeners dug into building the Enabling Gardens located behind HyVee in 2002. This work in progress features plant life, sculptures, a water feature and the George Washington Carver Learning Center where various events and classes are held. This past summer, a childrens garden was added with a sand box, musical instruments, blocks and more. 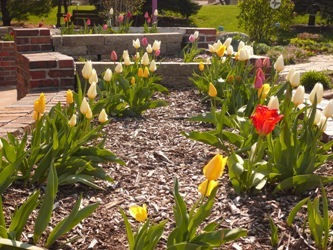 The gardens serve as a learning center for the public as well as a place to enjoy numerous annuals and perennials. Adjacent to the gardens you will find a pond surrounded by a walking and biking path.